The actress is ready to go back to work on the Ikaw Lamang set. 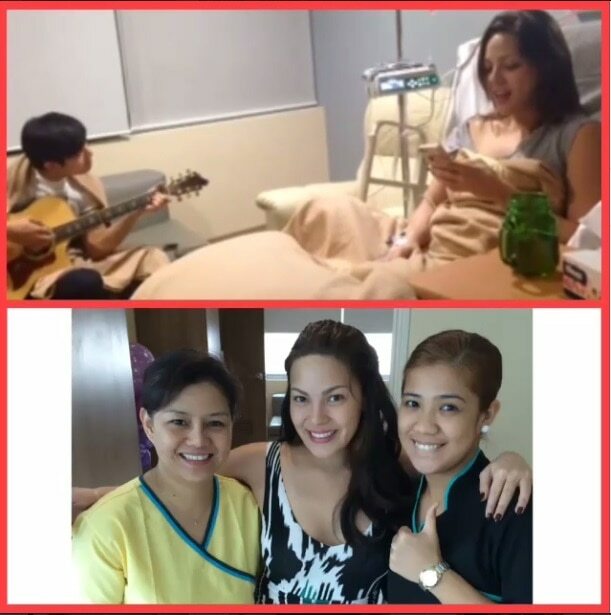 Actress KC Concepcion is now discharged from the St. Luke's Hospital after being confined because of dengue since October 11. KC gamely posed with the nurses who took care of her during her confinement and posted on her Instagram, "To all the Bedside Nurses on duty during my stay... Stay healthy & safe! God bless you all!! ???? I'm FREEEEE! Thanks to ur care.?? #NursesAreHeroes #StLukesBGC." KC was confined for almost 6 days. Just hours ago, KC also posted on Instagram a video of Paulo Avelino playing the guitar for her and actress Marian Rivera sending her flowers. KC could not wait to go back to work and prayed hard that she will be allowed to go back to work soon. Her teleserye, Ikaw Lamang, will be ending in a few days and she still has scenes to finish. She posted earlier today, "Waiting for my latest platelet count... Araw araw nalang ako kinukuhanan ng dugo!!! Hay... Mag kaka separation anxiety na ako sa mga MedTech na nag injection sa akin...sa sobrang close na namin... Hehe! Sana mag at least 150,000 na sya para ma-discharge na nila ako & makapag taping na ako tomorrow... Yes yes miss ko na mag work & FINALE na namin noh!!! ?? I'll see u soon Andrea."